Wisconsin's voting machines are vulnerable. A national study gave us only a C for election security. The good news is that the problems are fixable--and quickly, if we can get the word out. Only one critical unprotected risk leaves Wisconsin election results vulnerable to electronic hacking: Our county clerks don't now verify Election-Night vote totals with the paper ballots before they declare the elections final. 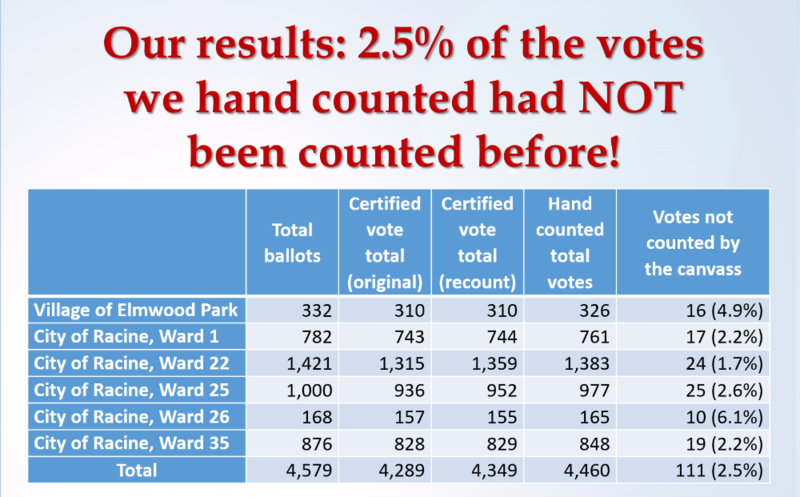 If any hackers ever manage to alter Election-Day vote totals, our county clerks wouldn't notice. They would declare the hacked vote totals to be our final, official election results. Our election clerks already have everything they need to verify accuracy: the paper ballots, enough time, the legal authority. National authorities and their counterparts in other states have developed efficient, economical methods to check voting-machine accuracy after every election. The problem is our county clerks don't know this. They don't perceive the need for election auditing and they don't know about the solution. Wisconsin has very decentralized elections. It's not the job of the state agency (the Wisconsin Elections Commission) to dictate review practices to the local officials. The county clerks are locally elected, accountable only to the voters. With only $4,500, we can educate local election officials about both the problem and the solution. We can also pressure on them to adopt modern election-management practices by educating other key local-government officials, key citizens, and local media . If we get the word out this summer, improvements can be before the November 2018 election. Funds will pay for printing, postage, and promotion of the information on social and other media. It's undeniable that Wisconsin's voting machines sometimes miscount, and that our county officials' review practices (call the 'county canvass') are insufficient to catch and correct these miscounts. I (Liz Whitlock) knew, from my own observation of the official 2016 recount—in which my team of observers click-counted votes as they were run through the Optech Eagle vote scanning machines—that many valid votes were not being counted. Despite widespread concern about election security, most state and local elections officials are still showing no sense of urgency to implement even the simplest audit procedures, such as those we demonstrated in our hand count. The only way to secure Wisconsin's elections is to manually audit the voting machines' totals, using our paper ballots. The only way to get those audits done is to pressure our local election clerks to do them. 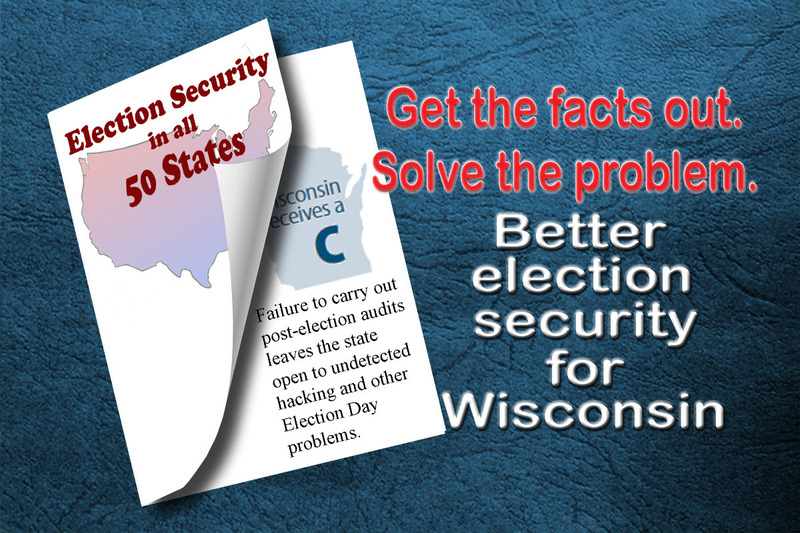 Wisconsin Election Integrity, a nonpartisan citizens group formed in 2012, is ready to launch a statewide publicity campaign to educate both voters and local election clerks about this practical safeguard. We have a glossy, professional-quality, independently fact-checked brochure ready to mail and a social-media strategy to get the word out. 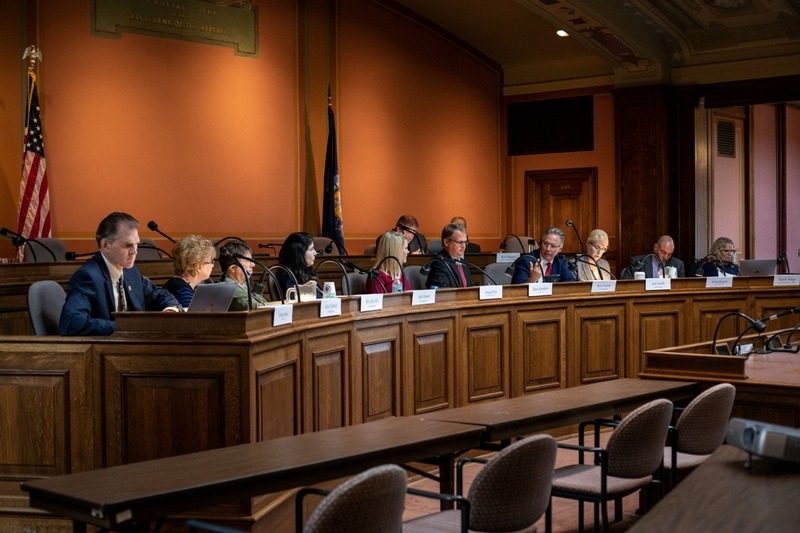 We will be bringing pressure on the Wisconsin Elections Commission to support the local clerks in adopting audit practices; on the county clerks to improve their procedures; and on voters to call their county clerks to insist on verified accuracy. Your contribution will help to cover printing, postage, and paid promotions, plus a few administrative costs like rental of a post-office box. We need your help to do this! Anyone who donates even $5 will be able to request either a paper copy of our brochure via snail mail or a PDF emailed to you, with our permission to reproduce it yourself if you want to spread the word even further, once we achieve our goal. Thanks for your concern about the integrity of our elections! 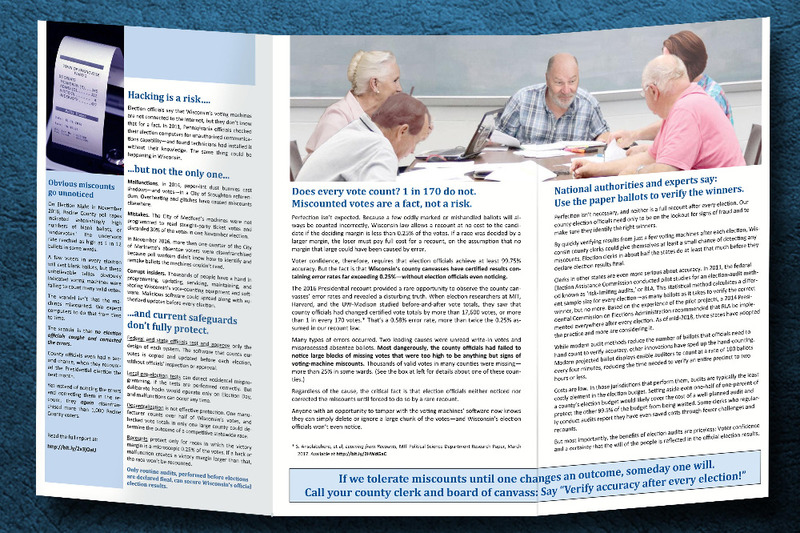 We are now in the process of printing and mailing our brochure, which makes the case for regular hand-counted audits in the state of Wisconsin! 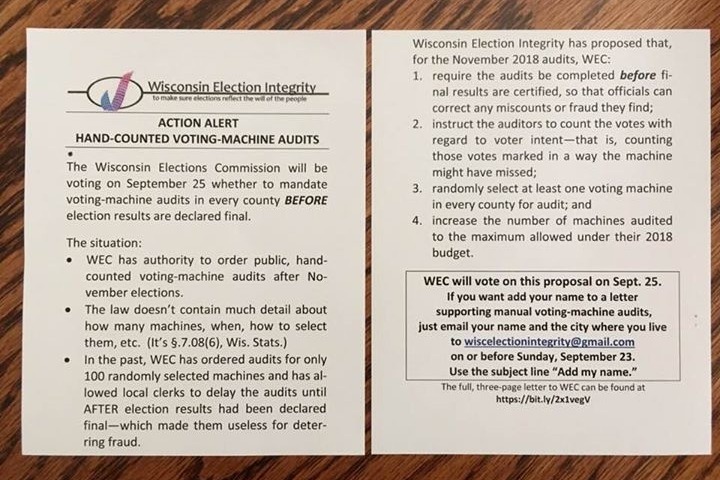 We were given a boost when the Wisconsin Elections Commission agreed to move the already mandatory post-election machine audits from AFTER the vote totals are certified to during the canvass period, BEFORE vote totals are certified. This means miscounts can be corrected—what a concept, right? We also made a video of how to do a public, transparent, hand-counted audit with just a video camera, projector, and a handful of click-counters. This will be made available to all County and Municipal Clerks. The brochure will be an added layer of reinforcement of citizens’ expectations that our votes be counted accurately. We spent many hours of bleary-eyed tedium looking up snail-mail addresses of County government officials, radio and TV stations, newspapers, and other organizations who should be concerned about election integrity, to add to our lists of County and Municipal Clerk addresses. We ended up with 2565 addresses! The brochure should reach people during the “lull” between Election Day on Tuesday and the beginning of the canvass period on that Friday. Hopefully there will be some public pressure from citizens calling their Clerks to find out when audits will be so they can attend. I will be emailing the final version of the brochure to all our generous donors who have made this project possible. Someday in the future, when we look back and wonder how on earth we could have trusted today’s ever-so-fallible technology for tabulating the votes that serve as our most effective voice in this democratic republic, we will know that we were on the right side of history from the beginning! On Tuesday, September 25, the Wisconsin Elections Commission (WEC) voted to mandate timely post-election audits for 5% of Wisconsin's voting machines, immediately following the November 2018 election. The municipal clerks in charge of these randomly-selected voting machines will be ordered to complete the audits BEFORE the election results are declared final. No other security measure comes close to the value of paper ballots and routine, manually counted audits, in terms of protecting final election results from tampering and in building voter confidence. They are the keystones of any election-security program. But before today, Wisconsin's failure to use its paper ballots in routine, pre-certification audits kept our election security ranked in the lower half of all states'. The WEC fixed that today. 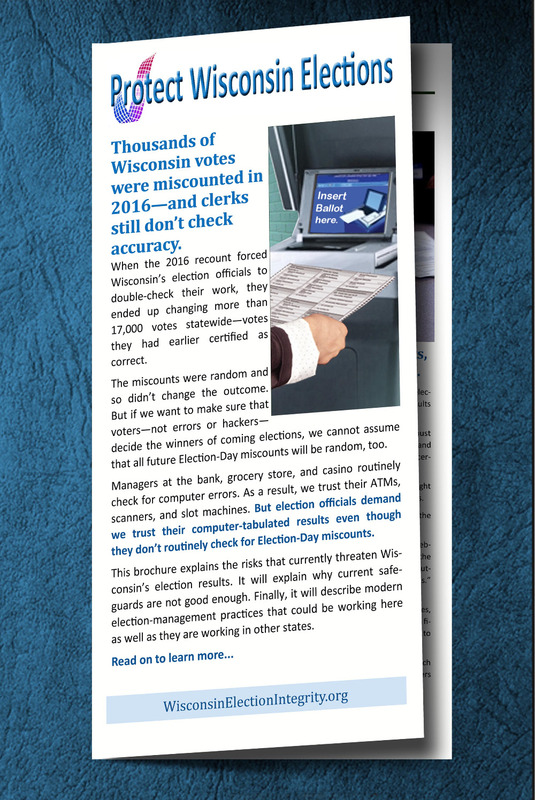 By ordering at least 1 in every 20 machines audited promptly after Election Day, the WEC moved Wisconsin into the top 10 or 12 states. The audit program still isn't perfect. Along with other problems, it lacks a clear policy regarding when clerks can let small discrepancies slide and when they should expand the audit to more machines. Instructions about investigating discrepancies are still limited to "Ask the vendor what happened." The policy applies only to November elections; primaries and nonpartisan elections will remain unaudited. Several other states still do more to verify that they are always declaring the correct winners. But today's decision was a solid, valuable step in deterring hackers and making sure any serious unintended miscounts are caught and corrected. Yesterday, Wisconsin was among the states that didn't bother to audit computer-tabulated vote totals, and today, we're among those that do. Email the Commission at elections@wi.gov to thank them, and encourage them to keep going until Wisconsin's election security is as good as any! The Wisconsin Elections Commission is meeting September 25 to consider the following for our November 2018 election. This is an easy first step toward regular hand count audits. Please read and give us your signature if you are a Wisconsin resident. Thanks for your support! Since we have not yet reached our GoFundMe goal, we have decided to donate ourselves the difference between what we have and what we need. We will keep the GoFundme going, not only for the other expenses we will have, but also to reimburse our own substantial contributions, at least in part. To have come this far and not have achieved our major goal would be out of the question! Once we have the revised brochure completed and ready to mail, we will send the PDF out to all of you. Thanks again for your important part in this work!